Buying a sofa online can be intimidating. 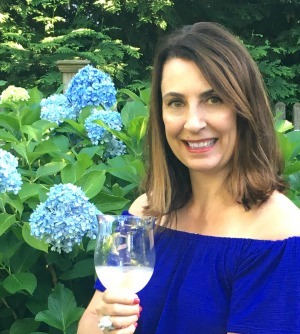 I’m sharing tips and tricks for buying sofa online so you can purchase with confidence and make sure you’re getting a quality sofa. rainbows and a new sofa. These are the things that make me happy (in addition to ice cold margaritas and free finds on the side of the road). Ever try to work with your old furniture in a new house. It doesn’t really fit but you put on a brave face (while crying inside) and make it work. That’s what was going on with my old sunroom sofa. It was huge – a sleeper sofa! It made the room feel cluttered. 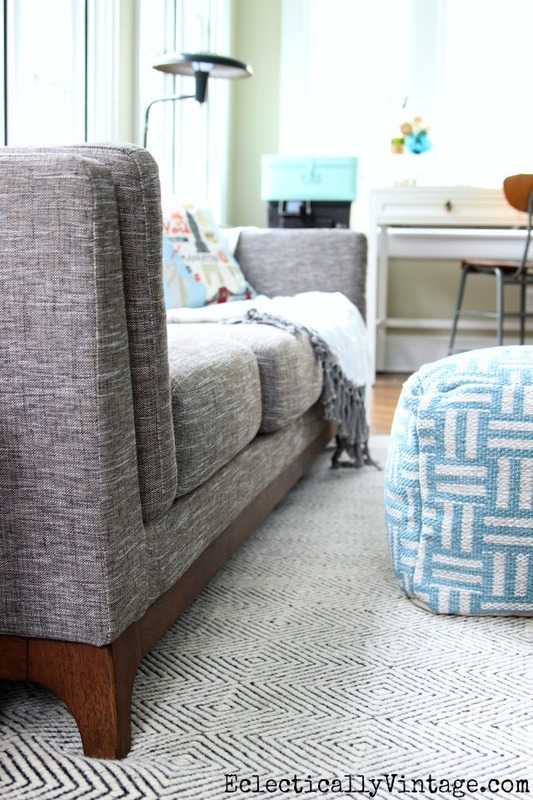 While searching for a new sofa, I stumbled upon Article (they are sponsoring this post) and fell in love with their clean lined furniture selection – specifically the Ceni sofa. 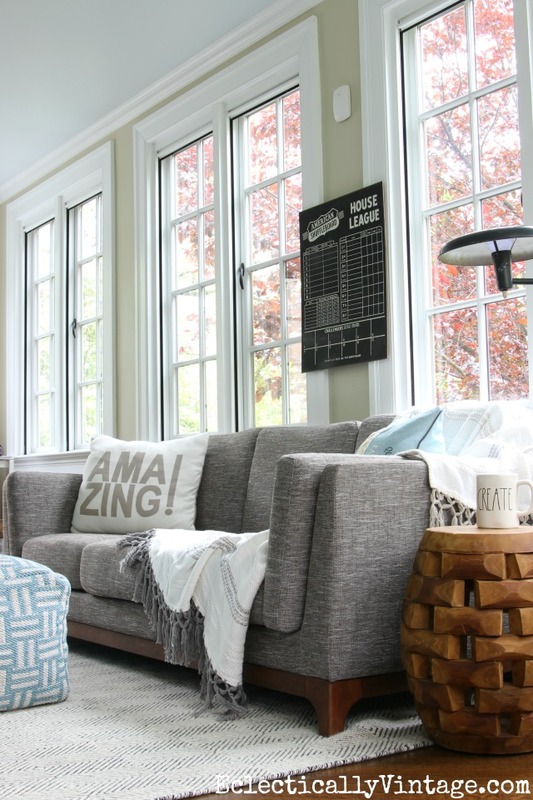 I love an eclectic home and mixing styles and this sofa is the perfect blend of classic-modern. Let’s face it – buying a sofa online can be scarier than watching Poltergeist alone, in the dark (remember the clown who pulled the kid under the bed)! Size – It’s hard to visualize the scale of a sofa from a photo. Use a measuring tape or better yet, tape off the dimensions on the floor to get a better idea of how the sofa will fit into your room. Don’t forget to measure height too – the back of the sofa and the arms (try moving similar height furniture in place for a good visual). Construction – Know what you’re buying! Is your sofa made with hard woods or particle board? Foam cushions (tight, firm seat cushions – maintains shape) or down (loosely filled – needs fluffing)? Don’t expect a sink into seat if you are buying foam cushions and don’t expect the cushion to retain it’s tight shape if you opt for down. Fabric – Know in advance the type of material used on the sofa so you can make an informed decision and determine cleaning methods. Color – Look for close up shots of the fabric. My sofa is gray but has beautiful flecks of brown, black, white and gray threads running through it which makes it the perfect neutral that can go with warm or cool colors. Reviews – So important! Read the reviews on the sellers website as well as third party reviews (Google “company + reviews”) to find out what buyers are saying. Delivery – Check out the delivery options and prices. Do you want the sofa set up in your house or do you want it delivered to your door where you will be responsible for getting it inside. Timing – Need the sofa next week? Make sure your sofa is in stock and ready to ship. Cost – Factor in total cost which includes purchase price (including tax if applicable), shipping and returns. I love that there is one flat shipping rate for an entire order from Article and you can return the sofa within 30 days (just pay the same shipping amount and make sure to return in the original packing materials). My favorite part is the solid wood base that wraps around the front, sides and back of the sofa. I also love the loose back cushions and the firmness of the sofa. It’s very comfy (not a sink into sofa) while providing lots of support. The true test is weather Sushi approves. Relief! As you can she, she’s just waiting for the remote so she can watch Lassie reruns. 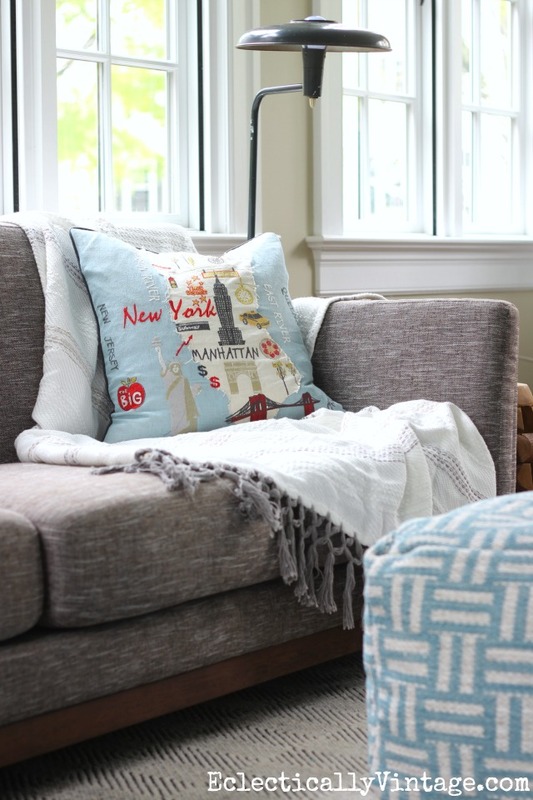 I’m really loving my new Article sofa and find myself wandering into the sunroom a lot more to cozy up with a cup of tea (ok, wine – don’t judge). Love your new sofa! They should throw in a free cute dog like sushi with every purchase! The info you gave is good for anyone purchasing a sofa period. Hope you had a wonderful Mothers Day! If cute dogs were thrown in, I’d have a dozen new sofas! Have a great week Ranell! 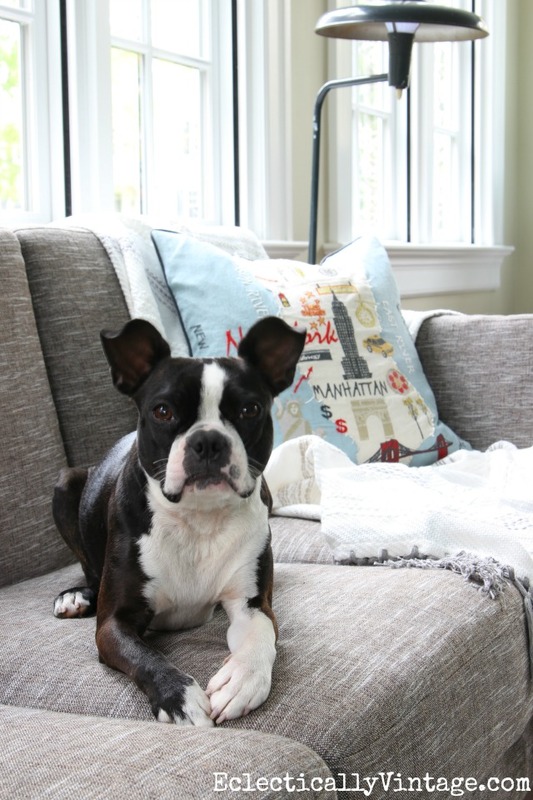 Beautiful sofa Kelly…Love the wood frame….This sofa is definitely YOU and so glad that Sushi gives it the “Paws Up” too!….and love the rug..perfect with the sofa! Thanks Shirley – I’m glad it’s Sushi approved! 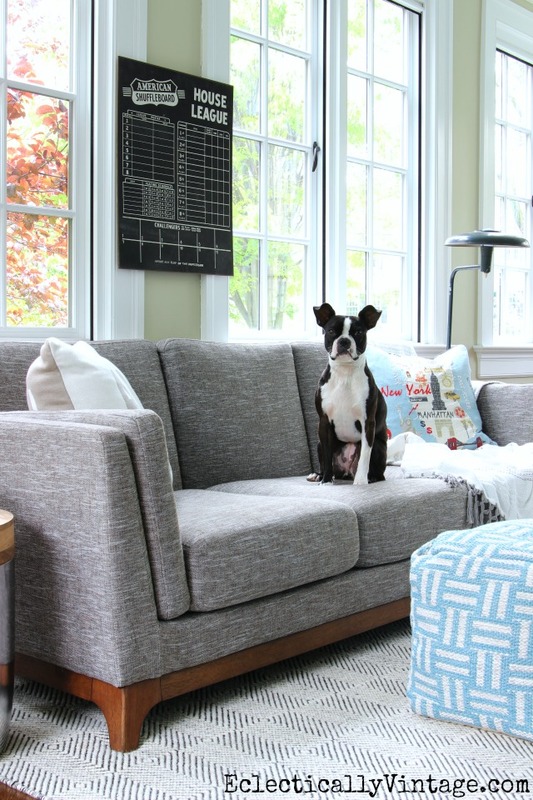 Funny- I have the same shuffleboard score board on my wall- a Boston Terrier and just purchased a new sofa. Your sofa is perfection,just the right color ( matches Sushi ) and looks comfy! Sushi says thanks – it’s her new favorite spot to watch tv! Love the room- and especially the dog. Can you tell me where you got the rug? Hi! I’m so glad you posted about *this* sofa. I’ve been looking at it recently as a potential purchase. I have two questions, if you don’t mind me asking. I have a little dog, too. How does the fabric seem to be holding up in regard to doggie claws–does it snag easily? Also, does the fabric “ripple” after many sits? Thanks for your time…and your room looks wonderful! Glad you like the sofa Lily! I don’t let my dog on the sofa without a blanket usually so I can’t attest to how it will hold up to her claws but I have to say the fabric is a nice tight weave. I haven’t had issues with rippling. I also love the rug! Can you share where you got it? Thank you for your post, seeing as some time has passed since you purchased the Ceni sofa from Article, I was wondering if you could answer a couple of questions for me. Firstly, are the cushions removable? And if they are, can they be flipped? How have they held up with regard to fullness? Are they maintaining their shape reasonably well? Additionally, how are you enjoying the fabric? Thank you in advance for taking the time to answer these questions. I love the Ceni! The cushions are all removable. Back cushions can be flipped but bottom ones can’t (they are not upholstered underneath). They are a nice firm cushion that have maintained their shape and I love the fabric. I am considering this sofa, but i saw reviews complaining of pilling upholstery with light everyday use. Having any such problems yourself? I have had no pilling issues – it looks brand new! How is the seat height on this sofa? I’ve been looking at a few on their website and noticed that the Ceni has a somewhat lower seat height (16″) compared to many of their other sofas. I’m worried it might be a bit low for my tall (6’1″) husband) Thanks! Thanks so much for this post! I’ve been thinking about buying this couch. I’m wondering how comfortable is it? Is it comfortable enough to nap on? It’s firm but comfortable. It isn’t super deep. I would check the measurements to see if you think it would work for naps. Thanks for the tips on the on line buying furniture. It has been very helpful. I’m loving that style and clean lines. Yes clean lines. Looking good. Thanks Mary – I love the clean lines too. Really opens up the room! 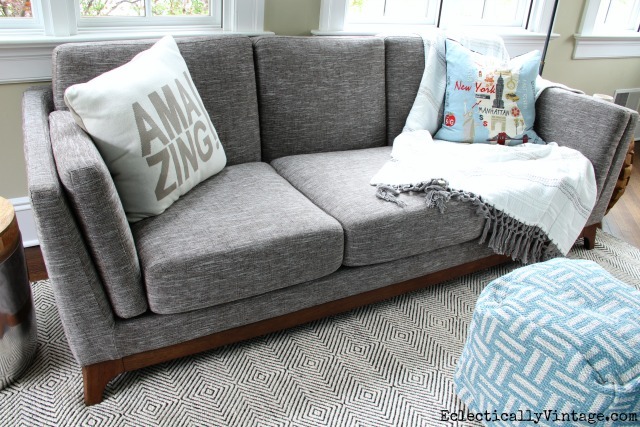 I have really fallen in love with the looks of this couch, but I’ve heard a couple reviews here and there about pilling/wearing fabric on the cushions after just a few months. I notice it’s been almost a year. Could you share how it is holding up? Do you find the cushions as firm or have they softened up? Is there any fading? Hi Angie, our sofa looks great. No pilling but we don’t use it every day. The cushions are firm – the same as the first day and there has been no fading. Hope that helps! Wow, I love it! I’m thinking about ordering the same sofa, actually….quick question though, do the cushion covers come off for washing? Thanks! Hey Kelly! Thanks for your review. I’m thinking of buying this sofa and the matching chairs for my new place, but am wondering whether you find dog hair sticks to the fabric. I have 3 dogs and don’t want something that will act as a fur magnet. I usually have my dog on a blanket not directly on the sofa! Anyway, she somehow manages to get herself on the sofa itself sometimes (LOL) and I really haven’t noticed her hair sticking. She’s a short haired dog – she doesn’t shed large tufts of hair. Hope that helps. Hi Kelley, I am interested in this sofa and wondering if it’ll be too low for me being that I am 5ft9?! Also, wondering about overall comfort. Thanks!!!? The sofa is definitely lower than my old one (which was a ginormous sofa bed). I’m 5’7″ and I think it is very comfy. My hubby is almost 6′ and likes it too. It is a firm sofa – you will not sink into it when you sit down. I really love the clean lines of it. Hope that helps! Very informative! I am planning to buying sofa online and I will keep in mind the above info. Thanks for sharing the great article. It really is a good idea to check out all of the delivery options as the article suggests. 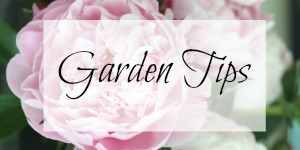 This could be especially important when ordering a fairly large piece of furniture like a couch. If you don’t think you can move it on your own then you’d definitely want someone who can bring it to your house for you and possible set it up for you as well.